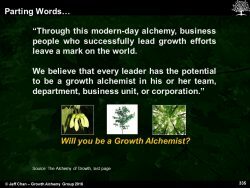 WILL YOU BE A GROWTH ALCHEMIST? 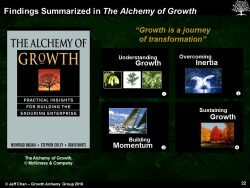 One of the more interesting projects in my time at McKinsey & Company, was the research and writing of a book entitled “The Alchemy of Growth,” whose three principal authors – Mehrdad Baghai, Steve Coley and David White – were my co-founders of McKinsey’s global Growth Practice. 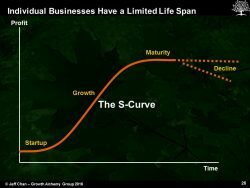 Individual businesses, like any living organism, have a limited life-span. Due to new technology, new competitors, changing consumer demand, or other market discontinuities, any business, no matter how large or robust, will eventually fail. 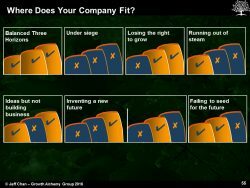 Great growth companies avoid the trap of the single business by creating a portfolio of businesses at different stages of evolution. 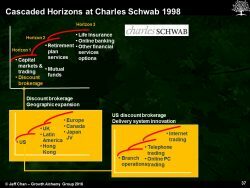 To sustain growth, they have managed across three time Horizons concurrently. Instead of planning for the short- medium- and long-term, they act now on initiatives that pay off in the present, mid-term and long-term. 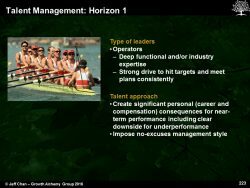 Like most companies, they keep a tight focus on their traditional core businesses, and manage for continued profit and cash flow. At the same time, they are nurturing and developing brand new businesses – sources of new revenue streams – some of which will become their core businesses of the future. And they also continuously generate new ideas and options, a few of which will be launched as new businesses. 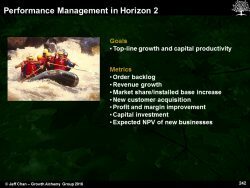 With a continuous stream of new ideas and new businesses to supplement their strong core businesses, these companies are able to sustain profitable growth over long periods of time. 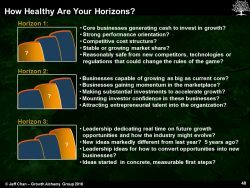 The question you should ask is what is the health of your company’s Three Horizons? 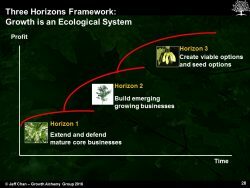 Is your company in great shape in all three horizons, or does it fall into one of the six unhealthy patterns? The prescription for each unhealthy pattern is different. Earn the right to grow: If your company is under siege or your core businesses are suffering, you need to improve the profitability of those businesses before embarking on your growth journey. Build new businesses: If your core businesses are running out of steam and there are no new businesses with the potential to become the new core, or if you have a straddle position in which your core is still strong but your new ideas have not been commercialized, you need to pick some promising ideas, commit resources, and bring them to market, and build a capability to do this on an ongoing basis. Generate ideas and options: If you have no new ideas or options that can be turned into new businesses, you need to establish processes and conditions that encourage innovation and idea generation. To create significant growth, companies must often reinvent themselves – redefining the markets in which they intend to compete. In this way, they create for themselves much greater “growth headroom.” This requires breaking constraining mindsets about who you are and what you’ll be when you “grow” up. 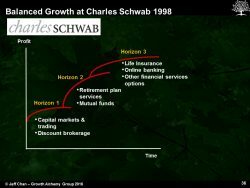 When growth companies populate Horizon 3 and then 2, they tend to exploit “seven degrees of freedom” over time. 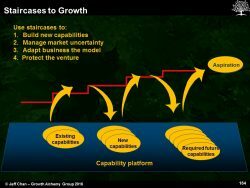 Most companies will address the first few degrees but may not be able to generate growth much more than their market growth – thus the generally conservative 1-3% growth found in the consumer products arena. 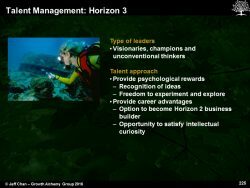 To achieve significant growth, companies need to push beyond their comfort zone and outside the normal boundaries of their business or even industry. This counters somewhat the notion introduced in “The Search for Excellence” that you need to stick to your knitting, which can have an extremely restrictive impact on growth opportunities. 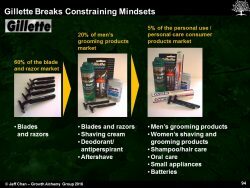 Here’s an example showing Gillette’s 7 Degrees of Freedom prior to its acquisition by P&G. 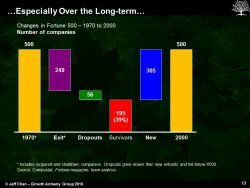 Choosing a growth strategy is more than just selecting one or a few promising ideas. The very nature of new businesses includes a high rate of failure – not always because of failures on the part of management, but due to the uncertainties and market conditions that can only be discovered and understood after a market entry. Our prescription is to build businesses using a Staircase approach – taking small steps at the outset, and accelerating investment and commitment as market knowledge increases and uncertainty is removed. 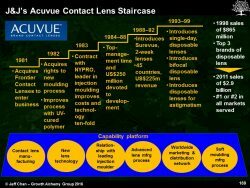 With each step, new capabilities are developed, assembled or acquired, which in turn allow for more steps, capability development, and growth of the business. 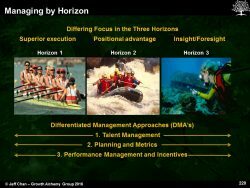 The concept of the Three Horizons suggests that each Horizon (or the businesses and initiatives in each Horizon) has a very different nature, and therefore demands different types of talent, different performance metrics and different management processes. 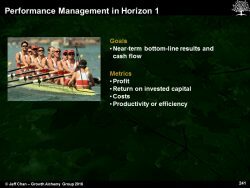 Horizon 1 is like Olympic rowing. It has a start and finish line; success goes to the team that executes the best, with everyone pulling in the same direction according to a plan. 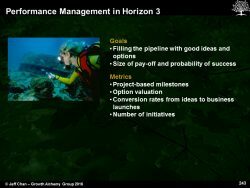 Similarly, the core business has an established business plan, and its all about execution. 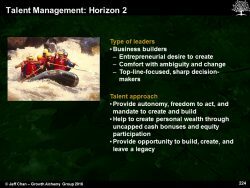 Horizon 2 – building new businesses – is like white water rafting. There’s a starting point, but the wild and turbulent ride may end up crashed on the rocks. There’s a lot of uncertainty and risk, but the ride will be exciting. In a new business, if there’s one certain thing, it’s that the business plan will undergo plenty of change, and there’ll be a high risk of failure. Horizon 3 is like diving for hidden treasure. You need a lot of dives to come up with anything valuable, and the odds are long that anything sizeable is discovered. It’s all about exploration, and trying out new directions and dive sites. In a business setting, it’s like R&D – many blind alleys before a successful new technology or product is developed and commercialized. So if we can describe the Alchemy of Growth in just a few pages, this must be easy, eh? The business book section of your local book store would make it seem so. These sobering charts suggest otherwise. 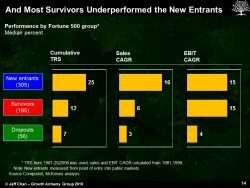 The next chart shows the fate of Fortune 500 companies and the difficulty in remaining in the top 500 revenue list as other companies grow faster and onto the list, or as companies slow their own growth, are acquired, or fail altogether. 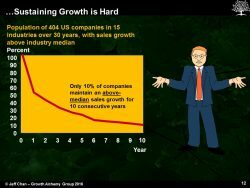 So no; growth is no simple challenge. It all starts from your view of the future – your vision – and how that rolls back to the things you need to do today and the near-term. 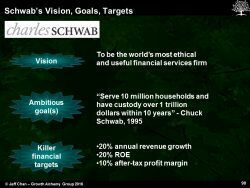 It starts with that vision – one that inspires the whole organization – a strategy to get there, ambitious or stretch goals to achieve along the way, and killer financial targets that put a hard edge on what is needed to be done by individual people. Everyone has the potential to be a growth alchemist, but not all achieve their full potential. 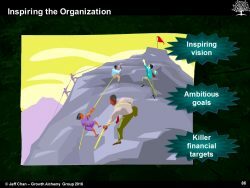 It starts with you – do you have the aspiration to kick-start, accelerate and sustain top-line driven profitable growth? 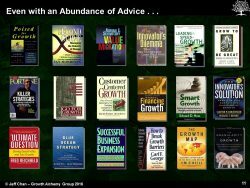 The Growth Alchemy Group was set up to help people and companies achieve that potential.